This is the book that answers one of the most asked questions in the living rooms of America today: Why do men watch so much football, anyway? Every Sunday afternoon in the living rooms of America, from the first week of September through the end of December, some 40,000,000 men are seated in front of their television sets watching football. Meanwhile, others are pouring into the stadiums all across the land, with a bounce in their step and hope in their heart. What is it that excites men about football? What’s the big attraction? Why is it that some men will sit down for three or six or nine hours in front of a TV set when football is on, yet they won’t sit still for more than 15 minutes for anything else when they’re at home? Why is it that some men get so emotionally involved in watching football that they’ll shout and cheer, jump around and otherwise act as if they might have a screw loose when their team wins — and become very upset or even depressed when they lose? There’s something going on in the mind of modern man that causes him to react in this fashion, something more than meets the eye. This book explains what it is. 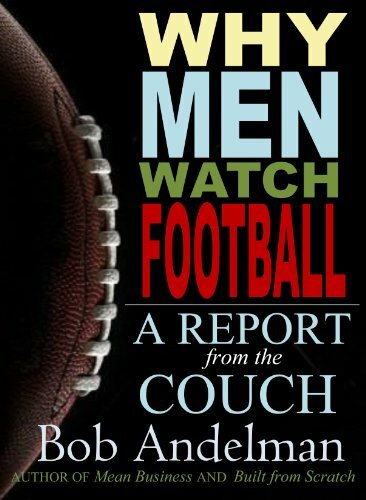 With the help of some of the nation’s leading sports psychologists and sociologists and dozens of male football fans, this book explores the male psyche and arrives at several intriguing conclusions about why men watch football. Bob Andelman is the author of 15 books, including his first biography, Will Eisner: A Spirited Life. Three of his co-authored books – Built From Scratch (written with the founders of The Home Depot), The Profit Zone (with Adrian Slywotzky) and Mean Business (with Albert J Dunlap) – were business bestsellers. His latest books include The Wawa Way, Fans Not Customers (with Vernon Hill), The Profiler (with Pat Brown) and his first work of fiction, The Consulate, a spy thriller written with Thomas Stutler. He also wrote four sports-related books: Stadium For Rent, Why Men Watch Football, Mind Over Business, and The Corporate Athlete. Andelman, a graduate of the University of Florida, lives in St. Petersburg, Florida, with his wife and a terrier named Chase. His son is a junior at Florida State University. Why Men Watch Football by Bob Andelman. Order your copy today by clicking on the book cover above!